Queens are to be produced at regular intervals: every 28 days with a single breeder queen; every 14 days with two queens and every 7 days with four queens. The system should be expandable, such that “QA” etc may represent groups of queens, instead of a single queen. A set of nuc boxes is required for each queen or group of queens, in order to keep lines separate and avoid possible disease transmission between them. The system is designed to accommodate the use of Nicot (or similar) cages, as well as grafting or cell punching. The schedule is designed to be operable by one person or a group, who would each have a copy, in order to ensure that everyone knows what others are doing, and when. The start date must be chosen according to local conditions. Drones should be flying or at least on the point of emerging, so they are mature and ready for mating in 3 weeks. Equipment needs to be at hand, especially sufficient mating nucs and, of course, sufficient bees to stock them. Colonies belonging to breeder queens can usefully provide young bees for nucs, as this will help to avoid swarming with the loss of valuable breeders. Day zero (0) is the day the first eggs to be used for breeding are laid by each breeder queen, which is taken to be the day she is put into the cage. All subsequent operations are counted from here. As shown, all operations are performed on Mondays and Thursdays (starting on a Thursday for caging, or a Monday for grafting) throughout the season, as indicated in Col.B. If desired, this could be changed, if desired, to any other pair of days spaced apart by 3 and 4 days. Col.B can be shifted to suit. Col.D shows the operations for a single queen, or group of queens. Each cycle is allocated 42 days from egg laying to final removal of laying queens, with provision for earlier removal of mated queens if required. The overlap between Cols. D and F is timed such that laying queens are removed in the same operation as placement of fresh queen cells, in order to maximise efficiency in labour and use of mating nucs. Col. H contains notes relating to QA and QB only. It is assumed that a bee breeder wanting to run 4 breeder queen lines will know what to do and when, using the prompts in the appropriate columns. If two breeder queens are to be used, their deployment is staggered 14 days apart, so that batches of mated queens will be produced throughout the season at 14 day intervals. If QC and QD are added into the scheme, batches will be produced at regular 7 day intervals. To complete 6 cycles for each breeder queen requires a season of 203 days or 29 weeks. This will not be possible in some areas as the season may be curtailed by unsuitable weather. 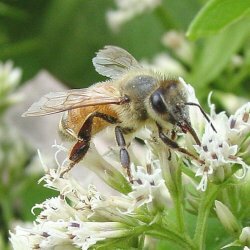 Bees do not always perform to schedule and weather is likely to influence the timing of operations at some points and in some places throughout the season. To maintain the schedule as shown, adjustments may need to be made that may disrupt the schedule. If this is undesirable, some cycles may have to be skipped, or other ways found to maintain synchronisation. For example: if a queen fails to lay into a Nicot cage on the scheduled day, grafting may be used instead on the appropriate day in order to ‘catch up’. By reading across from highlighted cells in Col. B, the day’s work can be seen at a glance, according to the number of breeding lines used (QA to QD). Day 0 is the day eggs are laid in the cage, if the Nicot or similar system is used. Therefore Day 4 is when freshly emerged larvae are transferred to the cell building colony, or when ‘grafting’ (really larval transfer) is performed, according to the method used. Cells may be checked for acceptance the following day, or Day 7 if sticking to the 4:3 system. This is the day to cage QC if using the 4-queen schedule. On Day 7 or Day 11 a check should be made for emergency cells built elsewhere in the cell building box. These must be destroyed, otherwise they may emerge early and kill the batch we are rearing. Cells will be capped on Day 9, but no action needs to be taken. Sealed cells may be moved to an incubator or to mating nucs, or caged for protection on Day 10, or left in place until Day 14, when they must be moved or caged to avoid early emerges killing the others. This is also the day to cage QC if you are using 3-4 lines. Virgins will most likely emerge on Day 16, but no action is required from the beekeeper. If four breeders are in use, QD is caged on Day 21 and larvae transferred on Day 25. Virgins may be checked for emergence and anatomical completeness on Day 18. There should be no further disturbance until Day 25, when an early check can be made for laying if the weather has been fine, otherwise, leave until Day 35, when laying queens may be removed if needed. The remainder can be left in place until Day 42, when any left un-mated should probably be discarded, unless poor weather conditions have prevailed and are now improving, but bearing in mind that mating nucs are now needed for the cells of QB, as this was started on Day 28 and cells must now be distributed. If necessary, an incubator can be used to bridge the gap, but only for a few days. Your carefully selected breeder queens are significant assets and essential to any successful bee breeding operation, so looking after them properly is vital in order to obtain the desired results. You need to consider housing and welfare in the context of the method you will be using to raise larvae (cage, punch, graft, etc), which will affect how much direct access you will need to your precious queen: if you need to cage her every 14 or 28 days, you will not want to be searching for her throughout a big, booming colony with multiple supers, but if you are using larval transfer (aka grafting), this is less of a consideration, although you will still need access to her eggs. One thing you definitely don’t want is your breeder queen(s) swarming and disappearing over the hedge. One solution to this is wing-clipping, as practiced by many beekeepers and breeders, which is certainly effective, but many will not want to risk damage to such a valuable queen, or risk her possible post-operative rejection by bees. An alternative approach is to confine your breeders, either within a standard hive box by means of a piece of queen excluder over the entrance (but this will also keep drones in or out), or by strategic placement of a vertical queen excluder within a hive, so as to confine her to one area, where she can lay eggs but not leave with a swarm. If you choose to keep your breeder queen(s) in a space restricted by a queen excluder, you will need to carefully manage the frames to which she has access, so that she does not run out of space to lay. This can be achieved simply by keeping her supplied with drawn combs to keep pace with her laying capacity, while removing laid-up combs to the other side of the excluder, or to other hives. In fact, this can be a good way to keep a cell-builder stocked with young brood, and timely comb management will enable you to get the best value from your queen in terms of egg production, while optimally looking after her welfare. If you want to know more about 'natural beekeeping', you can download a free Introduction to Natural Beekeeping article and listen to Phil Chandler's Barefoot Beekeeper Podcast. Details of balanced beekeeping courses.